So very sorry for your loss, Monique. Having lost my husband recently, I know a bit about the pain we go through during these times.That’s great you continued your fight for your son through your charity. Having purpose like that can so help in the healing process. That’s really nice of you to donate the proceeds. I’m so sorry about Caleb. What a wonderful thing for you to do! I’d never heard of amazon smile, so I’ll be checking into that too. Yes, Amazon Smile is a fine thing Amazon is doing. And Jamie, what you are doing is even finer. I wish you the highest sales with your new book. 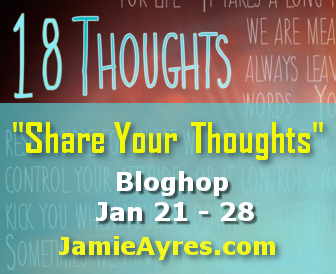 I just posted my post for your 18 THOUGHTS BLOGHOP. I hope you enjoy it. 🙂 I’m off to tweet about your book! Such a wonderful cause to contribute to. I am sorry about Caleb. I’m glad I stopped by. Your books need to be read. They have great messages. That’s an awesome cause, and really great of you to donate your proceeds. Also, I feel like an idiot. I buy constantly through Amazon and never had even heard of Amazon Smile. Consider me putting my Amazon purchases to better use! Jamie, I am so glad to be back with my favorite blogs. Been a while. Congrats on the last book. I hope all of this has convinced you to continue writing. We need more of you. I don’t know what it is like to lose a child … but I remember what my middle brother’s death did to my mother. That your friends took this unbearable grief and turned it into something wonderful is so amazing. Thanks for sharing their story. Got my copy of 18 Thoughts today! That is a very sad story about Caleb, but wonderful how the family is helping others in his name. My son’s name is Caleb, and we also know a family who lost a son Caleb to a tragic accident a few years ago. Very sweet of you to donate your royalties, Jamie. Good luck with your release! Thank you so much Jamie. You are helping keep us in a big way to keep Caleb’s story and short life alive with sharing. Thank you all for the kind, thoughtful words about my son Caleb. God Bless. So sad – Caleb sounds like he was a joy and brought people lots of love. We have a little one with leukemia at our school and we’ve increased awareness and funds over the last couple of years. Wonderful cause! My co-worker’s young daughter was diagnosed with cancer at the age of 5. Unimaginable heartbreak. Thank you for sharing and promoting awareness and a way to help. I’m seeing your book cover and blog hop EVERYWHERE. Well done, girl. Keep up the good work. My condolences on your and your friends’ loss. Good luck with the charity and your release. It’s a really special thing to donate proceeds to a personally meaningful charity. Lot’s going on here. Best wishes to Caleb;s Crusade. The world needs more of these. And I’ll have mine posted on my Weekend Follies post tomorrow afternoon. Hi Jamie. This is such a wonderful cause. Very touching. Thank you for sharing this. I won’t say I know how you feel,because I don’t. I do know loss all too well and the bumpy road of grief. I still am very active in two charities for cancer. I think fighting for something like that does draw on the anger you feel and gives it a positive outlet. At least it make me feel like I’m battling and gaining victories. I like your story about Caleb’s Crusade. My nephew Ryan contracted a rare form of brain cancer when he was 10. His mother, my sister, is my best friend as well as sister. She had her children before I did. I was there when they were born and she generously shared them with me. I’ve always been very close to them. I was actively there through all the treatments both as a support to my sister and her husband and because I loved Ryan. I was there for the battles and the victories, the tears, the laughter, and death. Ryan’s death left such hole…it’s still there and always will be.